Serena Auñón-Chancellor, B.S. '97, said astronauts learn to be like “graceful airplanes” floating in micro-gravity. Free from gravity and floating 200 miles above the Earth, NASA astronaut Serena Auñón-Chancellor, B.S. '97, said she’s become much more graceful maneuvering around the International Space Station since she arrived on board more than 100 days ago. Dr. Auñón-Chancellor is halfway through her six-month mission and has adjusted well to life on the ISS, which includes sleeping while hooked to a wall and using her feet to hold on as she completes daily tasks. It’s amazing what the body can get used to, she said. “We become like little graceful airplanes after a while,” Dr. Auñón-Chancellor said. Members of the George Washington University community and students from several District of Columbia public schools and Langley Middle School in McLean, Va., gathered in Jack Morton Auditorium on Tuesday to ask Dr. Auñón-Chancellor questions about her life on the ISS during a 20-minute Q & A session with the astronaut. She spoke from the Japanese module on the ISS, where a School of Engineering and Applied Science flag was displayed behind her. One student asked Dr. Auñón-Chancellor about what she eats on the ISS. Holding up pouches of dehydrated shrimp cocktail and teriyaki vegetables, she showed off the dinner she planned to eat that evening. “Once you add water it’s actually really good and spicy, so we like this up here,” she said. Most of the food astronauts prepare need to be rehydrated, but they do have some fresh food on board. Tortillas are a favorite among the international team of astronauts. “They tend to keep really, really well, and you can put just about anything in a tortilla and make it taste good,” Dr. Auñón-Chancellor said. Dr. Auñón-Chancellor launched for the ISS in June. After about eight and a half minutes of hurtling through the atmosphere, she could feel herself floating in micro-gravity. Her brain didn’t know how to respond to the adjustment right away, she said, and it looked like all the panels in the vehicle had tilted. Being in space impacts the body in several ways. Astronauts have to monitor changes to the optic nerve in the eye and are required to exercise for more than two hours a day to prevent bone and muscle atrophy. Their faces also look more bloated on the ISS because fluid in their bodies moves to their head. These changes often make them sound like they have a cold. Every day is different on the ISS, but the astronauts are busy preparing for upcoming space walks, conducting experiments and doing maintenance on the ISS. Like any older house, the ISS needs regular upkeep. The astronauts work for 12 hours a day, but they enjoy spending time together playing music on Friday and Saturday nights. They have two guitars, a small keyboard and a recorder on the ISS. While the current astronauts on board come from the United States, Russia and Germany, they are like a family, Dr. Auñón-Chancellor said. Dr. Auñón-Chancellor studied electrical engineering at GW and was a flight surgeon before becoming an astronaut. She knew she wanted to work for NASA when she was a young girl, and her family always encouraged her passion. People told her the odds of achieving her dreams were low, but she encouraged the audience to tune out negative voices. Members of Dr. Auñón-Chancellor’s family were in the audience for the event, which was also broadcast live on Facebook. Following the Q & A session with Dr. Auñón-Chancellor, Charles Camarda, M.S. 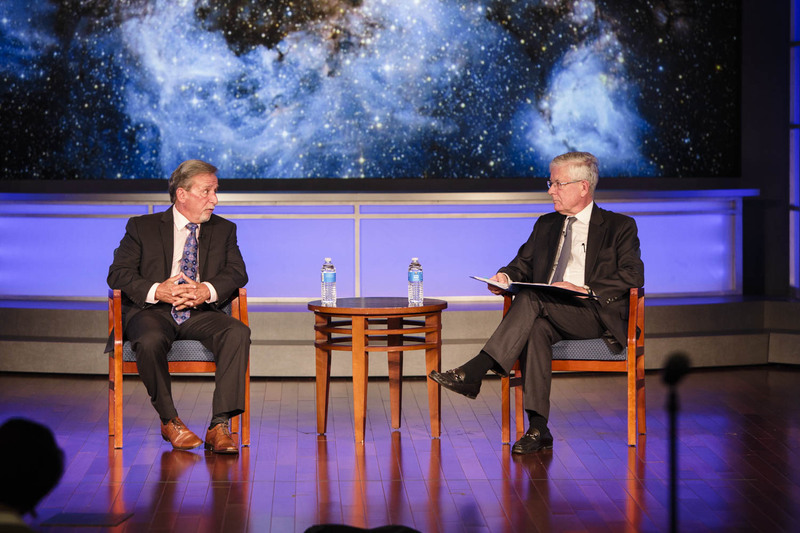 ‘80, a former astronaut, finished answering student questions and sat for a discussion with David Dolling, an aerospace engineering professor and former SEAS dean, about his experience in NASA and about the challenges of deep space exploration. Dr. Camarda flew on a Discovery mission in 2005 and logged more than 333 hours in space. NASA announced earlier this year plans to return to the moon before embarking on a mission to Mars, a move that has been debated for years. Dr. Camarda said he would like to see NASA focus on getting humans to Mars. The United States was in the middle of a space race when it landed the first men on the moon. This time around, he said, the best and brightest from around the world will be needed to tackle the challenges of deep space. NASA astronaut Serena Auñón-Chancellor, B.S. '97, will launch for her first spaceflight in early June.